Ba Thien Hau (Pagoda of the Lady Thien Hau) is regarded as one of the oldest, largest and most beautiful temples of about 30 Chinese pagodas in HCM City. 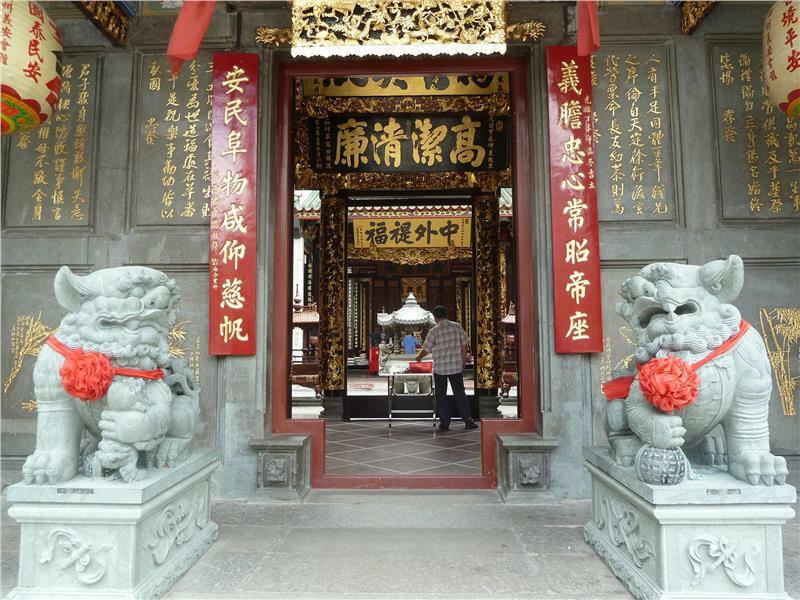 According to historical documents, the temple was built by a group of Chinese immigrants from Guangzhou in 1760 then restored continuously in 1800, 1842, 1882, 1890 and 1916. Many of the materials used for constructing the pagoda were brought from China. The temple is located at 710 Nguyen Trai Street, District 5, Ho Chi Minh City. The pagoda was built in the characteristic style of the Chinese. It is dedicated to Thien Hau, the Lady of the Sea ("Tian Hou" as transcribed from the Chinese), who is also known as "Mazu". The temple is located on busy Nguyen Trai Street. It can be accessed by entering an iron gate and crossing a small courtyard. 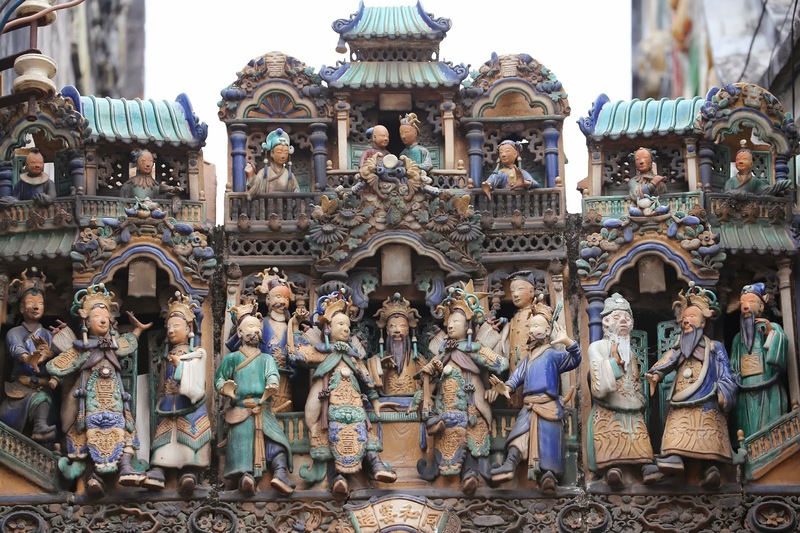 The roof is decorated with small, delicately fashioned porcelain figurines expressing themes from Chinese religion and legends. Lanterns and wooden models of Chinese theaters hang over the entrance. 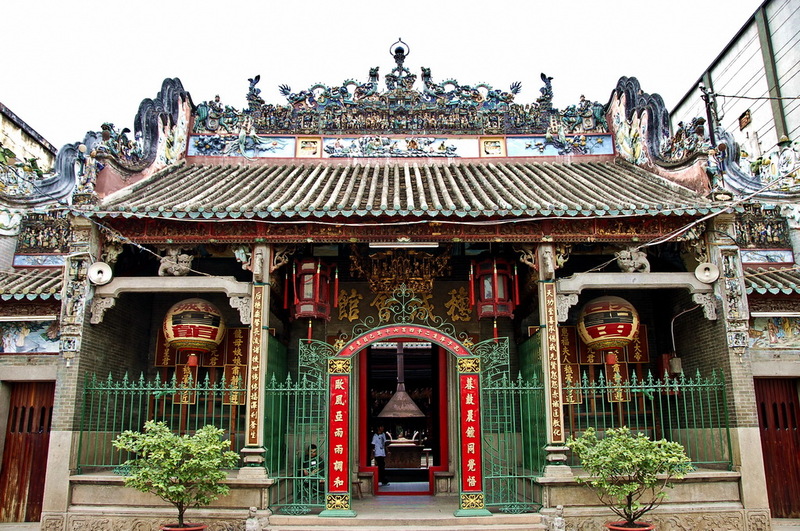 The interior of the temple is actually a partially covered courtyard, at the end of which is the altar to Thien Hau. The exposed portions of the courtyard contain incense burners, and open the view to the remarkable porcelain dioramas that decorate the roof. The dioramas show scenes from a 19th-century Chinese city, and include such colorful figures as actors, demons, animals, and Persian and European sailors and traders. In one scene, actors depict a duel on horseback between the revered halberd-wielding general Guan Yu of the novel Three Kingdoms and another fighter. Another scene depicts three Taoist sages representing longevity, fecundity and prosperity. The altar to Thien Hau is dominated by the three statues of the goddess. The faces are bronze in color, and the clothes and crowns are multi-colored. 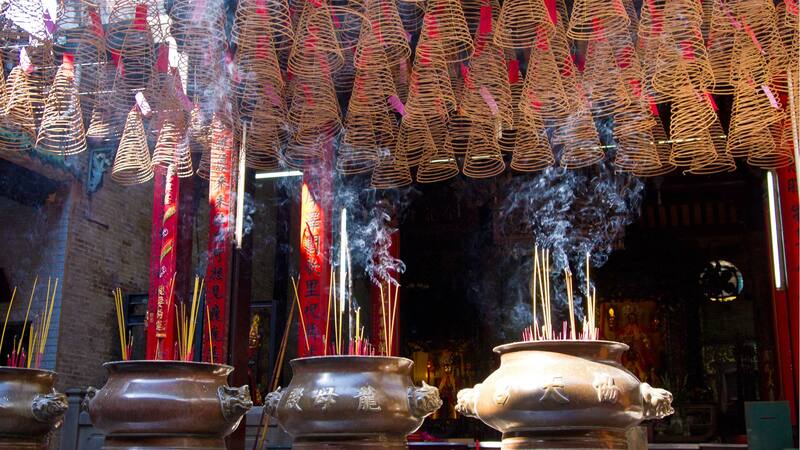 Incense burners are all about. One of the distinctive features are ceramic reliefs that cover the entire roof, walls and altars of the temple. They were produced by two pottery kilns in China in 1908. 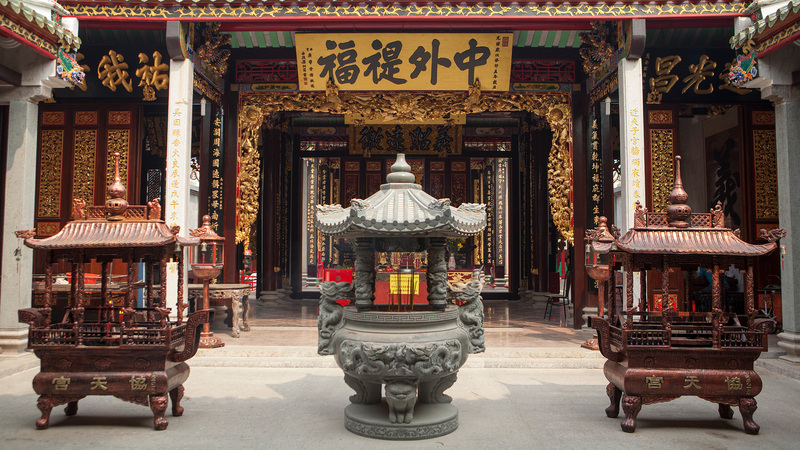 The pagoda has many precious antiques, including a set of censers produced in 1886. 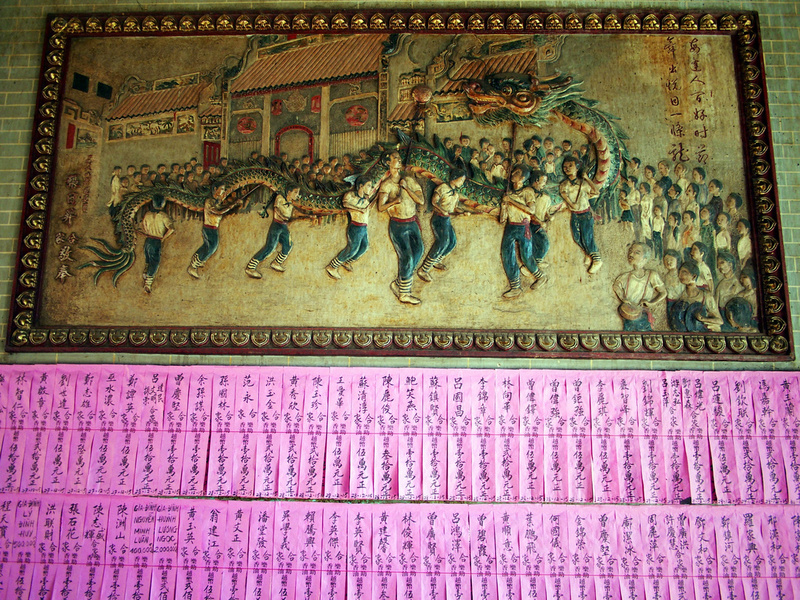 According to statistics, there are over 400 antiques in the pagoda, including seven god statues, six stone statues, nine stone steles, two small bells, four copper censers, one stone censor, 10 horizontal lacquered boards, 23 parallel sentences and others. All these artifacts are meticulously crafted. 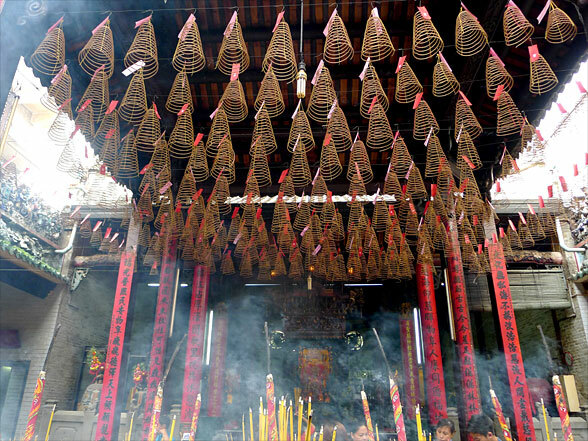 The interior of the temple is a partially covered courtyard, at the end of which is the altar to Thiên Hậu, where stand three statues of the goddess. The faces of the statues are bronze in color, and the clothes and crowns are multi-colored. 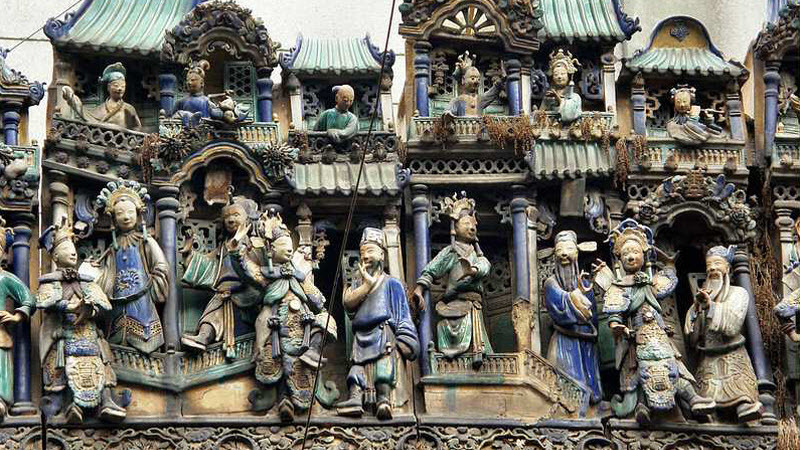 The exposed portions of the courtyard contain incense burners, and give a view of the remarkable porcelain dioramas that decorate the roof. The dioramas show scenes from a 19th century Chinese city, and include such colorful figures as actors, demons, animals, and Persian and European sailors and traders. One scene depicts three Taoist sages representing longevity, fecundity and prosperity. 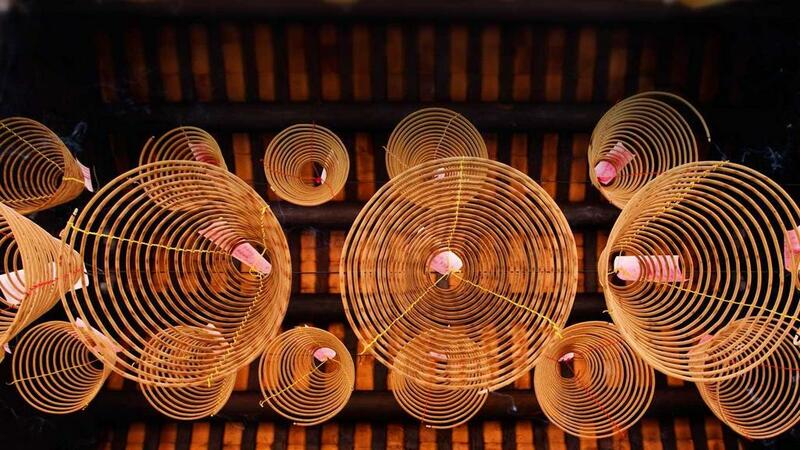 Suspended over the main worship area, in front of the altar of Thien Hau, are dozens of incense coils. 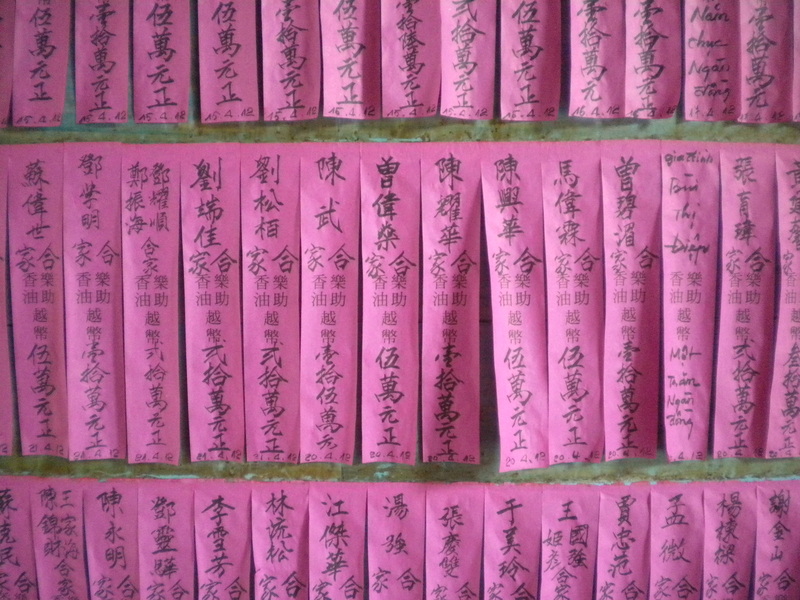 Visitors to the temple frequently purchase these, attach their names to the coils, and then have them hung from the ceiling of the temple. 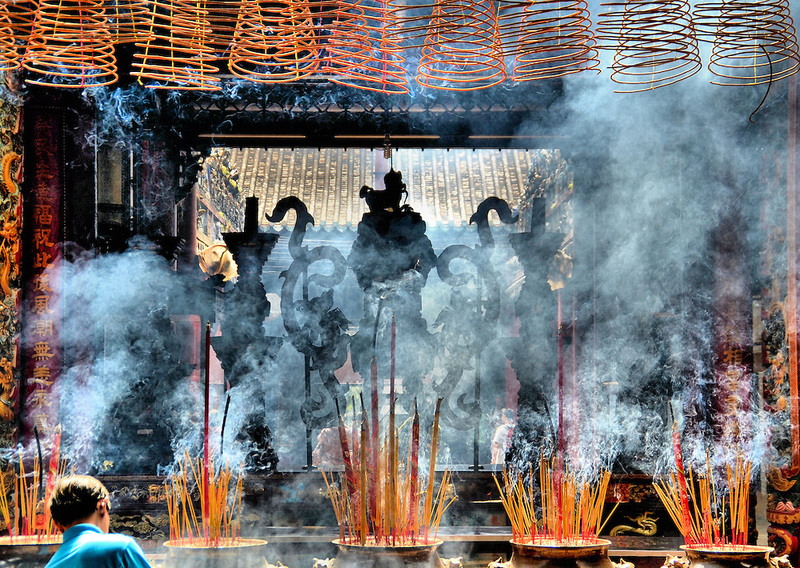 As the incense smoke curls upwards in the air, the pilgrims believe their prayers are transmitted to the deity. 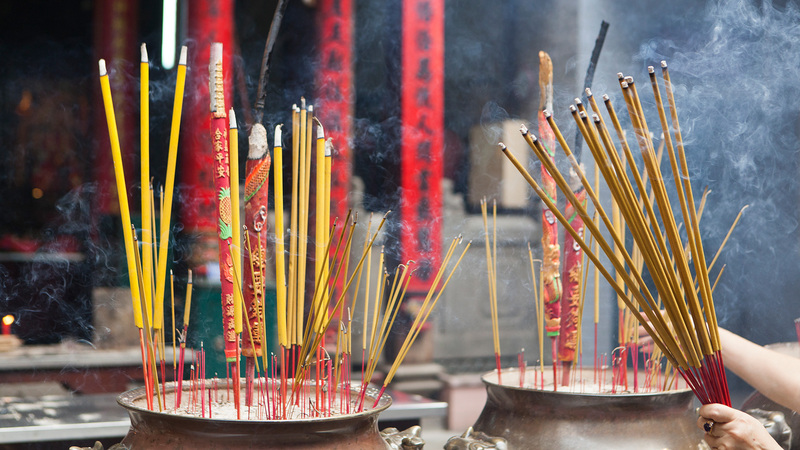 Many of the incense coils are quite large, with a diameter of more than a meter, and can burn for several weeks. 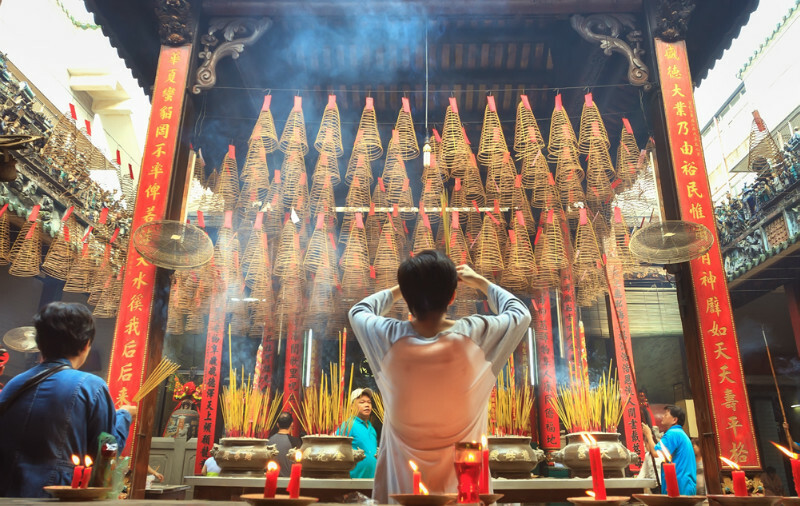 The pagoda is not only a valuable work of history, architecture, and sculpture but also an important religious site of the community of Chinese-Vietnamese in HCM City.